Set in a Western Indian territory just after the turn of the century, the stubborn rivalry between the local farmers and cowboys provides the colorful background against which Curly, a handsome cowboy, and Laurey, a winsome farm girl, play out their love story. With these two headstrong romantics holding the reins, love’s journey is as bumpy as a surrey ride down a country road. 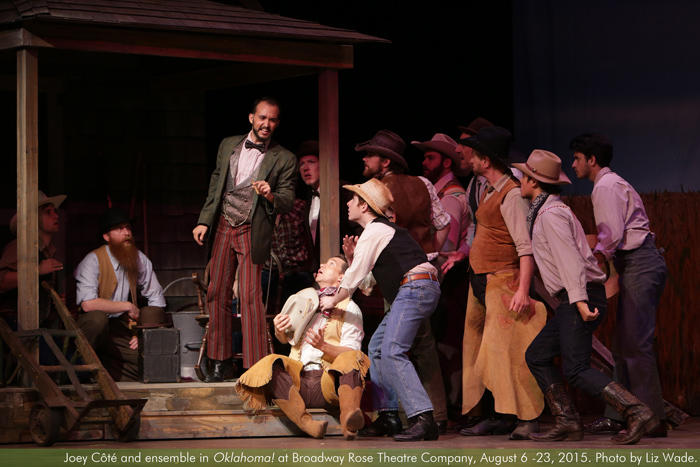 Facing the dawn of a new life together in a brand-new state provides the ultimate climax to the triumphant Oklahoma! Performance run time is 2 hours and 45 minutes, including one 15-minute intermission. JARED MILLER (Curly) is a native Minnesotan, part-time New Yorker, and Portland resident who has performed on stages from Florida to Alaska and many places in between. Portland credits include Othello and Somewhere in Time at Portland Center Stage, Next to Normal at Artist’s Repertory, and The Huntsmen and Bloody Bloody Andrew Jackson at Portland Playhouse. Other credits include Oklahoma!, South Pacific, The Full Monty, 1776, Comedy of Errors, Moon Over Buffalo and A Year with Frog and Toad. DRU RUTLEDGE (Laurey) is so happy to call the beautiful Northwest her home since graduating with her master’s degree in Opera Performance and moving to Portland in 2009. Since moving to Portland Dru has performed locally with Portland Opera, Portland Center Stage, Broadway Rose, Lakewood Theatre, Mock’s Crest, BodyVox, The Oregon Symphony (on the Distant Worlds Tour), and the Portland Gay Men’s Chorus. Recently Dru also performed with the New World Symphony in Miami. Visit drurutledge.com for more on Dru. COLIN WOOD (Jud Fry) holds an M.F.A. in Acting from Minnesota State University, Mankato and has worked as an actor with professional theater companies in Montana, Michigan, Minnesota, and Oregon. Locally, he has performed with the Beaverton Civic Theatre, Live On Stage, Tapestry Theatre, the Classic Greek Theatre of Oregon, Lakewood Theatre, Staged!, Bag&Baggage Productions, Stumptown Stages, and Broadway Rose Theatre. He has also performed at the Theatre Fringe Festival in Edinburgh, Scotland and is an Equity Membership Candidate. Favorite show credits include 110 in the Shade (File); Of Mice and Men (Lennie); Oklahoma! (Jud Fry); The Fantasticks (El Gallo); The Wild Party (Eddie); Guys and Dolls (Sky Masterson); The Taming of the Shrew (Petruchio); and The Rainmaker (Starbuck). MEGAN CARVER (Ado Annie) just can’t say no to an opportunity to perform with Broadway Rose! Megan has been acting professionally across the Northwest for over a decade and feels blessed to be doing what she loves. Some favorite past shows include It’s a Somewhat Wonderful Life (Petunia, Bag&Baggage Productions), Hairspray (Penny, Broadway Rose), Legally Blonde (Pilar, Pixie Dust Productions), and Forbidden Broadway (Actor, Broadway Rose) to name a few. She has also appeared on the hit TNT series Leverage and on NBC’s Grimm, as well as several local films. Please visit www.megancarver.com for more upcoming projects! 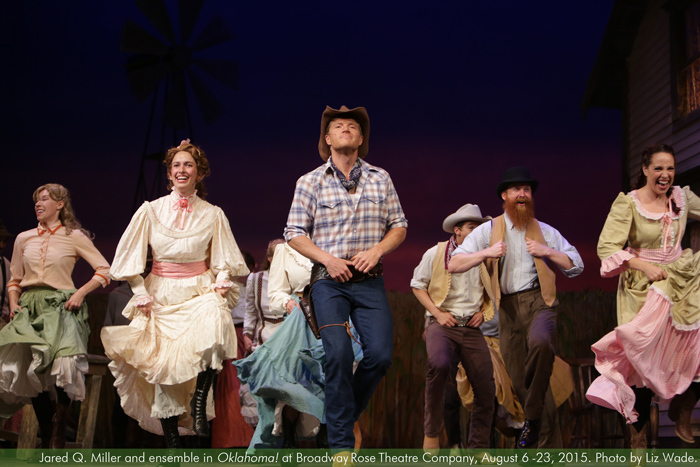 JOEY CÔTÉ (Ali Hakim) is thrilled to be returning to Broadway Rose in Oklahoma! Previous appearances include Dopey in Snow White, Troubadour in Cinderella, Ewart Dunlop (a barbershopping school board member) in The Music Man, and most recently as Man 1 in The World Goes ‘Round. Joey has also had the pleasure of working with Dan onstage as LeFou in Beauty and the Beast (Pixie Dust Productions). Recent performances in the area include Dad/Booger in Ivy + Bean (Oregon Children’s Theatre), Francis in La Cage aux Folles (Pixie Dust Productions), and Ensemble in Spamalot (Lakewood Theatre). JAMES SHARINGHOUSEN (Will Parker) is imploding with excitement to be making his Broadway Rose debut! He was recently seen with Oregon Children’s Theatre as Uncle Hobart in Ramona Quimby, as Quiz Kitties/El Buzzito in Skippyjon Jones, and Toad in A Year With Frog and Toad (Drammy Award). He was also seen as Michael in Tick Tick Boom!, and as Nicky/Trekkie in Avenue Q with triangle productions! Other credits include Emcee in Cabaret, Will Parker in Oklahoma!, Clown 1 in 39 Steps, and Motel in Fiddler On The Roof with Clackamas Rep. Other Portland credits include: Jerry in At Home At The Zoo with Profile, and Betty/Gerry in Cloud 9 with Vertigo. He also works as the actor trainer/manager at Fright Town, a seasonal haunted house event. Some of Nan Gatchel’s favorite roles over the years have been Gerri Vandervooten in Star of Hope for Sowelu Theater and April in Savage in Limbo for Sowelu Theater, Huckabee in The Fantasticks for Broadway Rose and Golde in Fiddler on the Roof for Lakewood Theater. Nan is also a member of SAG-AFTRA and has credits in commercials and film. DAVID SARGENT (Ike Skidmore) is excited and happy to be back at Broadway Rose, having previously appeared in The Best Little Whorehouse in Texas and The Sound of Music. He also appeared in several shows at Lakewood Theatre, including Mame, Show Boat, South Pacific, and White Christmas. Originally from Southern California, David has appeared on the TV series CSI and in several feature films including Dragnet, Number One with A Bullet, and Galaxies Are Colliding. He also spent several years performing with The Groundlings Improv Group in Los Angeles, and is a proud 2014 graduate of PSU with a B.A. in History. CHRIS CHEEK (Andrew Carnes) spent five years with The Portland Opera Chorus and The Portland Opera Players. He is thrilled to be back onstage after a long absence while pursuing a career in law enforcement. He has also appeared with The Rogue Opera, Eugene Opera and The Opera Theater of St. Louis. Broadway shows include Fiddler On The Roof and South Pacific. 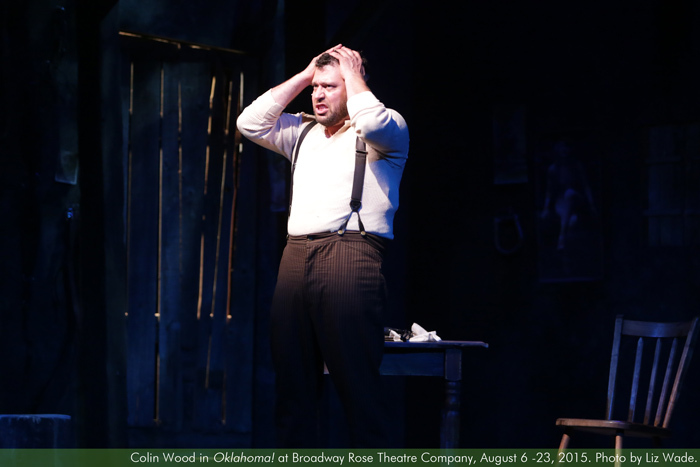 MATTHEW BELLES (Cord Elam) is thrilled to make his Broadway Rose debut! Most recently, he performed in the ensemble for Storefront: The Babes are Back!! at triangle productions! Past credits: 9 to 5 (Joe), It’s a Wonderful Life (Harry Baily) and Rent (Gordon/Ensemble) at Stumptown Stages; South Pacific (Buzz) at Lakewood Theater, The Last 5 Years (Jamie) and Children of Eden (Adam/Noah) at Capital Playhouse, and Putting It Together (Man 2) at Western Washington Summer Stock. SASHA BELLE NEUFELD (Gertie) Portland Playhouse credits include: A Christmas Carol (Martha/Soprano soloist), How to End Poverty (Ensemble), The Other Place (u/s The Woman), and Inhale, 9 Questions. Other credits include: The Truman Show: The Musical (Becky), My Children! My Africa! (Isabel), Urinetown (Soupy Sue), Othello (Desdemona), King Lear (Cordelia), and Language of Angels (Celie). Sasha is very excited to be making her debut at Broadway Rose. B.A. Theatre and Drama, Indiana University. CLAIRE ZAVISLAN (Dream Laurie) grew up dancing and studying musical theater in the Colorado Jazz Dance Company under the direction of Zetta Alderman. She went on to receive her B.F.A. in Dance from the University of Arizona School of Dance. Her prior work includes dance roles in Cabaret with the Colorado Springs Fine Arts Center, Guys and Dolls with UCCS Theaterworks, and The King and I with Opera Theater of the Rockies. She has also danced as a member of Moving People Dance Company in Santa Fe, NM and Cocodaco Dance Project in Evanston, IL under the direction of Ronn Stewart. Claire is delighted to be a part of her first production with Broadway Rose! Sharon Maroney, at the company’s artistic helm, has directed a sharp, appealing production…Jeffrey Childs’ musical direction, and his first-rate orchestra, pull it all together…Read more. 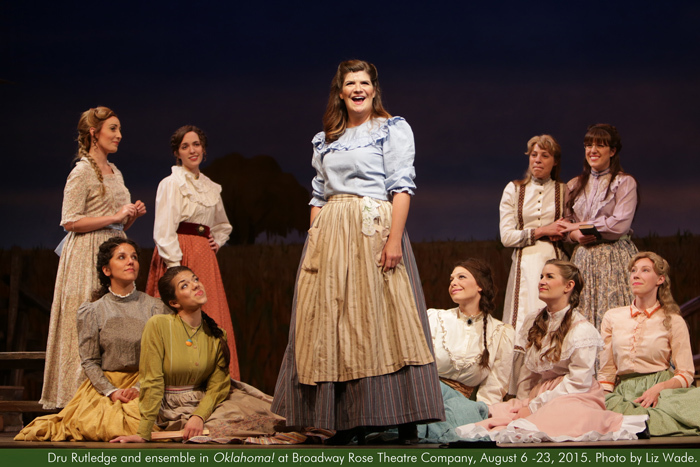 The current production at Broadway Rose, directed by Sharon Maroney, is OKLAHOMA! at its best. It’s everything you could possibly want from this musical (at least it’s everything I wanted) — a beautiful love story, great music and dancing, and also a deeply emotional tale of the conflicts and uncertainty experienced by people trying to sort out their future…It will take you all of two notes of the opening song to fall in love…Read more. 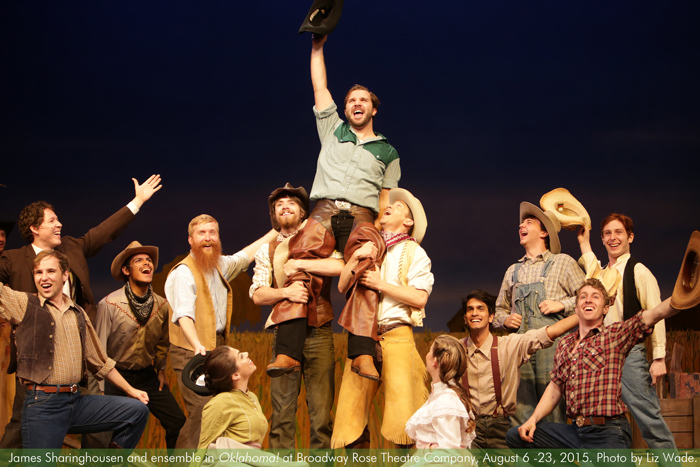 Broadway Rose’s Oklahoma Climbs Clear Up To The Sky! When it comes to Broadway style musicals, few local theatre companies can even hope to compete with Broadway Rose’s big summer productions. 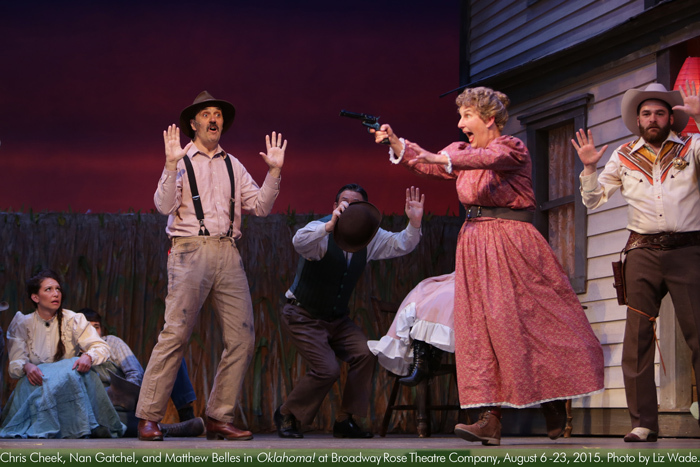 Director Sharon Maroney’s experienced hand ensures that the Oklahoma audience will see and hear a consistently professional, first-class show – elaborate and evocative sets, effective lighting, superb leads and vocal ensemble, crisp choreography, and an orchestra to die for…Read more. Miller is a fine Curly, giving both the bravado and vulnerability of this character, and blessed with a strong singing voice. Rutledge had an operatic range, which she puts to good use, and is convincing as the conflicted Laurey…Read more. Joey Côté steals the show as the conniving peddler Ali Hakim. That is not to say that the uniformly spectacular cast didn’t make its own impression...Read more. ...from the first notes of “Oh What a Beautiful Mornin,'” sung by Jared Miller, the audience knew this musical was going to be something special. And it was, right up to the final curtain…Read more. A Giant Adventure in Artslandia Thank You to Broadway Rose! Three students from Camas High School, Madeline Bertalot, along with her mom Jill, Morgan Dunn and her mom Melinda, and Isaac Dizon, were treated to see last week’s Sunday matinee of Oklahoma! 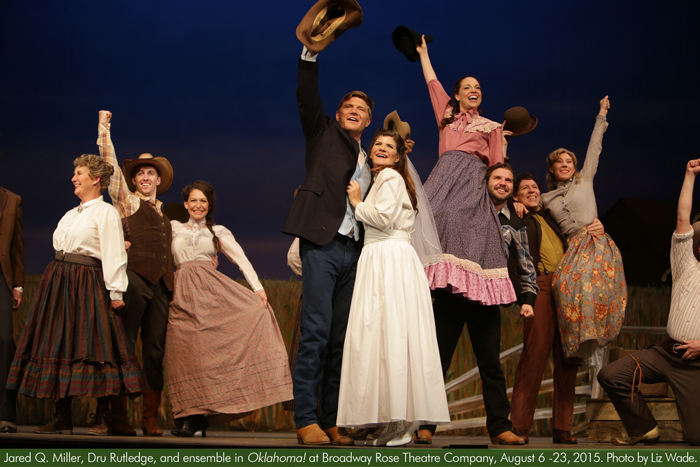 Take a listen and find out why you should get your tickets now, for Oklahoma’s final performances this weekend!…Read more. …But then the Tigard company has a habit of doing musicals up right — big sets, meticulous costumes, top-quality Equity talent. 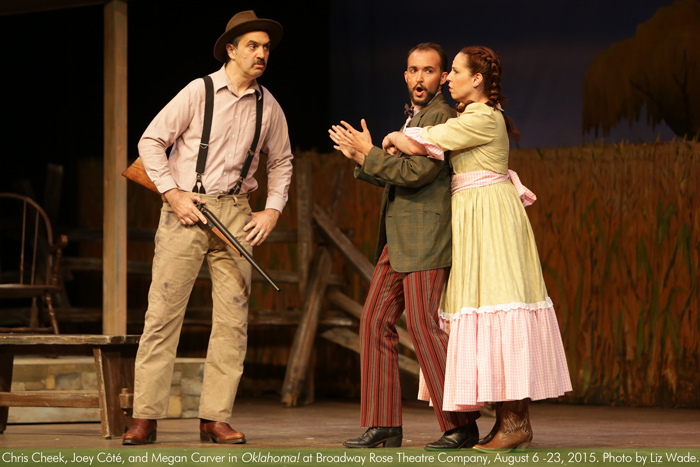 Leading the “Oklahoma!”‘ bench are Jared Q. Miller, who’s credits include “Somewhere in Time” at Portland Center Stage, “Next to Normal” at Artists Repertory Theatre and NBC’s “Grimm”; and Dru Rutledge, an opera alumni who picked up a Best Actress Drammy earlier this summer for “She Loves Me.”…Read more. “These classics are the reason I fell in love with musical theater and I want to pass on the experience,” Maroney said. “About 10 percent of the audience will be under the age of 30, and most of them will never have seen this classic before. I try to produce these classics at the level of a National Tour, but at a reasonable ticket price, so anyone who wants to can see the show.”…Read more. 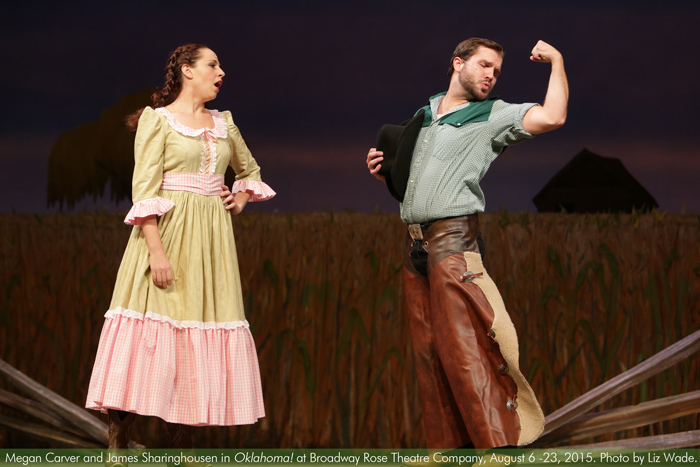 “Oklahoma!” stars Dru Rutledge (Laurey) and Jared Q. Miller (Curly). Photo by Craig Mitchelldyer. 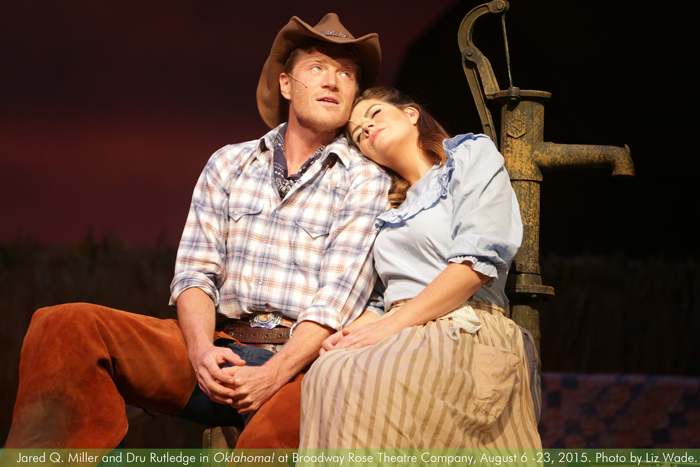 Just like the characters they play in Broadway Rose Theatre Company’s production of “Oklahoma!” the two lead actors have Midwest roots…Rutledge grew up in a small town in Kansas called Emporia, and Miller grew up in Minnesota, and they both worked all over the United States before finally settling in Portland within a couple years of each other…Read more.